Norwex has a few different sponges and ‘scrubbies’ to choose from in their catalogue. When I do a party, Norwex newbies are a little confused about which sponge to add to their purchase, since there are a few options. Since this is a confusing decision for a lot of people, I’m going to take time to break it down for you, so you can decide which sponge is ‘just right’ for the jobs you might have in your home! Why choose a Norwex Sponge? First, we need to tackle the subject of, ‘But…why?’ Why not just grab any old sponge you can get when you’re grocery shopping? I mean, a sponge is a sponge, right? Well, no, actually. Not all sponges are created equal! Based on personal experience, I can tell you that these sponges are the BEST sponges I’ve ever used. They are not an ‘ordinary’ sponge! I’ll go into more detail about what makes them special when I talk about each one. The most important thing you should know about all of the Norwex sponges is that these are TOP quality sponges that will last you a long time. This is an absorbent sponge with an abrasive wrapping. I love that this sponge is abrasive enough for tough jobs, yet WON’T scratch most surfaces. And- its encasing is earth friendly! Scrubbing the top of your ceramic stove with the Cleaning Paste. I cross my heart, that this will NOT scratch the surface. Know that this is the most effective when paired with the Cleaning Paste, and is not nearly as effective on its own (other than for a quick scrub, not a deep clean). Scrubbing the shower or tub with Bathroom Cleaner. This sponge gives just enough abrasive punch to help scrub off that extra build up. Use with the Bathroom Cleaner to be the most effective (dilute Bathroom Cleaner, spray on surface, let sit 10 minutes, scrub with Spirisponge, then rinse). 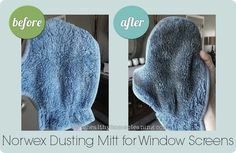 I’ve seen similar products to the Norwex Spirisponge in dollar tree stores and hardware stores. I’ve purchased them, out of curiosity, noticing that they were a lower price than the Norwex Spirisponges. However, once I got them home and used them, I found that they just didn’t compare to the Norwex ones! The once I’ve purchased in stores look almost identitcal, except that the criss-crossed silver parts are not quite woven as tightly. This seems to make a BIG difference, as the ‘other’ brands simply weren’t as effective at scrubbing! So, I recommend the Norwex brand, and definitely feel they’re worth the extra price! (especially since they’re so versatile and long lasting). Add a drop of dish liquid to the middle of your sponge, and rub it against itself, rinsing out the suds when you’re done scrubbing. Or, throw in the top rack of the dishwasher. This is a sponge with a two-sided wrapping. One side is slightly abrasive (it’s the same material used in our Kitchen Scrub Cloth), and one side is a soft, absorbent EnviroCloth. That means that this sponge is handy for jobs that require a bit of scrubbing and/or a bit of wiping. And I’ve got to say, it is so darn handy to have the ability to scrub and wipe with the same sponge. Ummmmm; I’ve never seen a product like this one! So simply put: it doesn’t compare! The scrubby side of this sponge is like no other ‘scrubby’ sponge. I used it one day to scrub my cupboards, and I couldn’t believe how much old food spills it wiped away. Not to mention sticky blobs.When I was done scrubbing, I simply flipped and wiped it clean.And I only needed water, since the EnviroCloth side removes up to 99% of bacteria from the surface using just water. That alone makes this Sponge the best darn sponge you could ever own! I fell in love instantly! The soft, EnviroCloth side also contains our signature BacLock feature, purifying itself in between uses. So, this is WAY BETTER than any other germ infested sponge! Between uses, make sure you’re wringing this out and allowing to air dry. In between uses, you can add a drop of Dish Soap to your sponge, rub it against itself, then rinse the soap out well, under running water, then air dry. 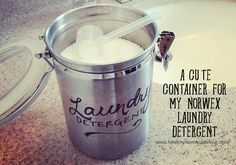 These can be thrown in the washing machine (I’ve personally never tried this), or washed in the top rack of the dishwasher. Since the EnviroCloth side is self-purifying in between uses, as it dries, you don’t need to be constantly laundering this baby. These are similar to an eraser you may already be familiar with (one that has ‘magical’ qualities). Except that these ones haven’t been bleached! These hand pads aren’t for everyday use – I like to save them for those special, extra tough jobs. They are disposable, so they’re not going to last you super long (hence why you save them for the extra tough jobs). These are tough on stubborn stains, yet less aggressive than an abrasive scrubber. To use, simply moisten with water and rub on the stubborn stain. crayon, marker, pen, scuff marks and soap scum. This is basically exactly the same as similar products, in my experience, except for the fact that you’re avoiding exposure to the bleaching agent that makes other brands white (the Norwex brand is a light blue/gray). But in terms of performance – it performs just the same as other brands (which is very well). Since this is a disposable product, it is not washed in between uses. It can be used multiple times, and is disposed of once it has broken down. However, you can make this product last longer in between uses. Since it begins to break down once moistened, simply cut in half’s or fourths, before you use. You only need to use and dispose of the small piece you used on your job, and have more leftover for next time! Technically, this isn’t a sponge. But these are popular cleaning tools, and many customers love them (and ask about them). These don’t hold onto water like a sponge would, but you do use them with lots of water. These are reserved for special scrubbing jobs on tough surfaces (as these are very abrasive, and can scratch many surfaces). They can be a bit of a concern, since they can scratch surfaces, but once you have a feel for what they’re safe on, they’re lifesavers! You’ll see, from my list below, that this ‘sponge’ is best friends with the Norwex Cleaning Paste. They love to do everything together! Scouring the inside of my stainless steel sink with water. When I want to do a deep clean of my sink, I use this, with water and the Cleaning Paste. Scrubbing the inside of my oven (with lots of water and Cleaning Paste), ESPECIALLY the inside of the oven door window. Scrubbing hard water build up on drains and the edges of faucets (carefully, so I don’t scratch them). You can purchase very similar products in stores to this one. They perform the exact same, in my experience, on your tough jobs. Both Norwex and similar brands unravel and stretch as they’re used. But the Norwex Spirinettes are smaller, which means they don’t get super big and stretched out like other brands. I like them for this reason, as they’re easier to fit in my hand. I find that the Norwex brand lasts longer than any other brand I have used as well, which makes them worth the price. Add a drop of dishsoap to the wet spirinette. Rub it against itself, then rinse well. You can also throw this in the dishwasher, on the top rack or in the utensils basket. And to be honest – I never actually ‘clean’ this item. I might do the dishsoap thing if there’s bits of food stuck in it, or swish it around in a sink of water, to get those bits out. But other than that, I just use and abuse it until it’s all stretched to the max! Norwex has four sponges to choose from for your tough cleaning jobs. All four are effective at what they do. They all have versatile uses for every room of the home. If you want to know what one you should DEFINITELY get first, I recommend the Spirisponge, since it’s abrasive, yet doesn’t scratch. This can be used with the Cleaning Paste for many jobs, so if you’re getting the paste, then yes yes yes, get a pack of Spirisponges to go with it! If you’ve got tough cleaning jobs in the kitchen you want to tackle, especially on pots and pans, or on your ‘always brown’ kitchen sink, get a pack of Spirinette’s to have on hand, as you’ll find yourself reaching for them! If you are a sponge lover, but are trying to ‘give it up,’ after you’ve heard how bacteria-ridden they are, swap it out for an EnviroSponge. You’ll be so darn happy you did! And if you’ve got some tricky marks around the house you’ve been wanting to clean up, the MicroHand Pads are where you should start! Hope these details have helped! To get your hands on one of these sponges, visit my shop at www.healthyhomeshop.com! I love that I can hand the microcleaning pads to my kids to clean the scuff marks off of the walls- when we used the magic erasers from the store, I wouldn’t let the kids anywhere near them, and had to clean all the walls by myself! How can I purchase one of these items? You can shop online at http://www.healthyhomeshop.com . Thank you!